Home News & Events Uncle Henry's wins at the Lincolnshire Co-op Awards! An awards ceremony was held at Lincolnshire Showground on Wednesday 27th March and brought together hundreds of team members from across the trading area alongside suppliers to Lincolnshire Co-op. Lincoln City football manager Danny Cowley was the guest of honour and the event was hosted by BBC Radio Lincolnshire’s Melvyn Prior. Graham Ward, Acting General manager at Uncle Henry’s was presented with their “Supplier of the Year” award on the evening. 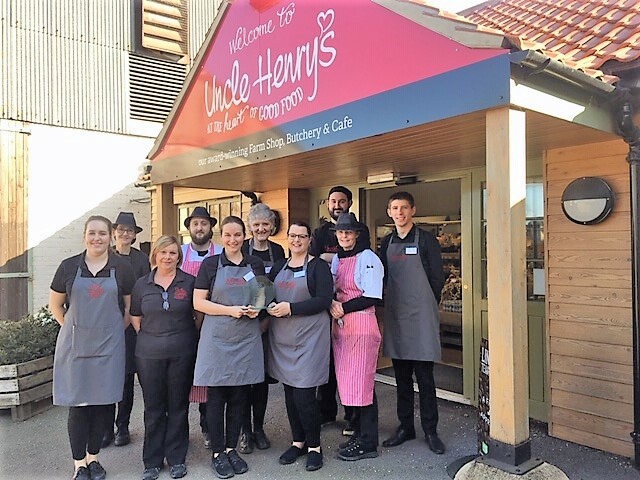 Uncle Henry’s traditional butchery uses their own home reared pork to produce a wide range of award-winning pork products and first began supplying the Lincolnshire Co-op with their caramelised onion sausages in May 2017. This was shortly followed by Uncle Henry’s traditional home cured short back bacon and then Lincolnshire sausages. In May 2018 a new product of Lincolnshire sausage patties proved to be a hit with both Uncle Henry’s and Lincolnshire Co-op customers. Over 70 Lincolnshire Co-op stores now stock Uncle Henry’s products!